2018 is turning out to be an incredible year for Casio G-Shock with the brand’s 35th Anniversary in April and the release of many limited edition models starting in late 2017 to celebrate the occasion. We’ll be listing all the 35th Anniversary releases here, with the most recent arrivals at the top. 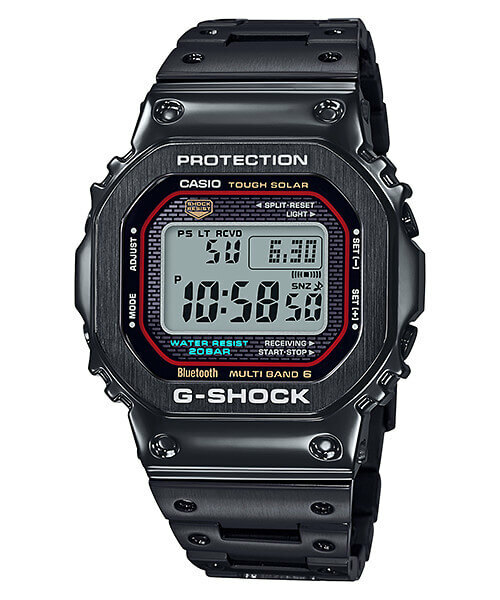 A 2019 release, the G-D5000-9JR is being billed as the last 35th Anniversary watch. 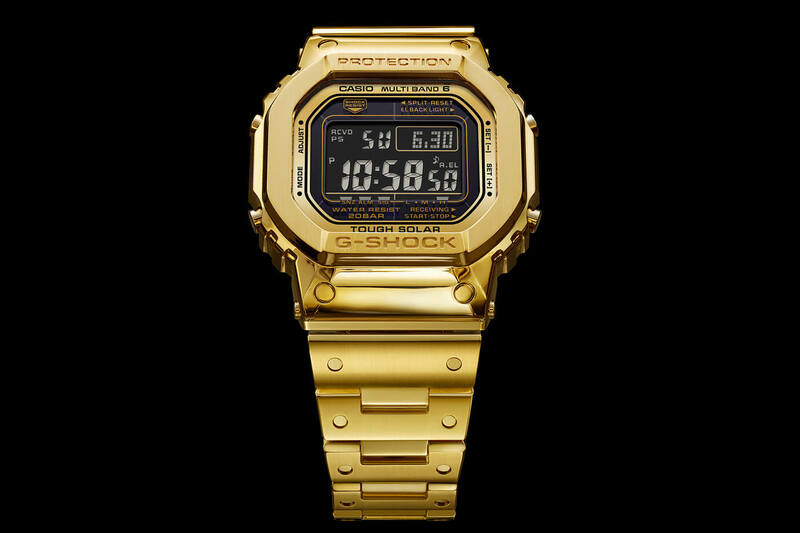 Made out of 18k gold, the watch has a list price of about $69,500 USD, making it the most expensive G-Shock watch of all time. Only 35 pieces will be available and it will likely be available only in Japan. 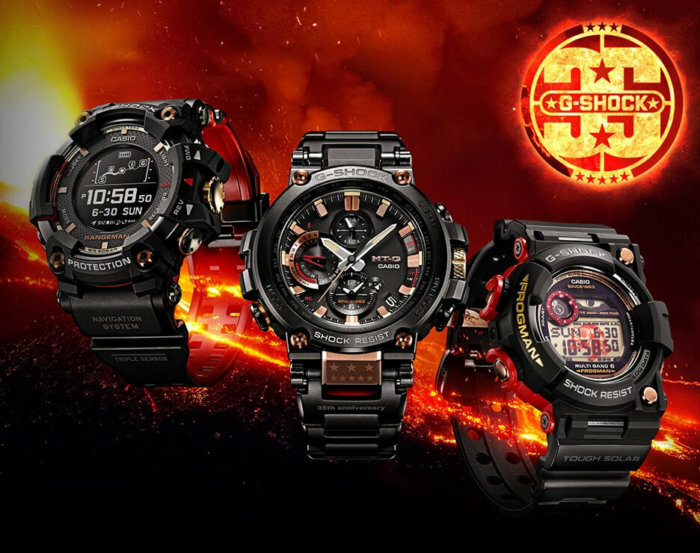 The Magma Ocean Collection includes three deluxe G-Shock models: the GPR-B1000TF-1 Rangeman, GWF-1035F-1 Frogman, and MTG-B1000TF-1A. The magma ocean theme represents returning to the origin while creating something of value. These black watches have rose gold and red accents to signify the anniversary. The inclusion of the GWF-1035F-1 is an interesting choice as there hasn’t been a new GWF-1000 Frogman in a while and this year marks the 25th anniversary of the Frogman line. 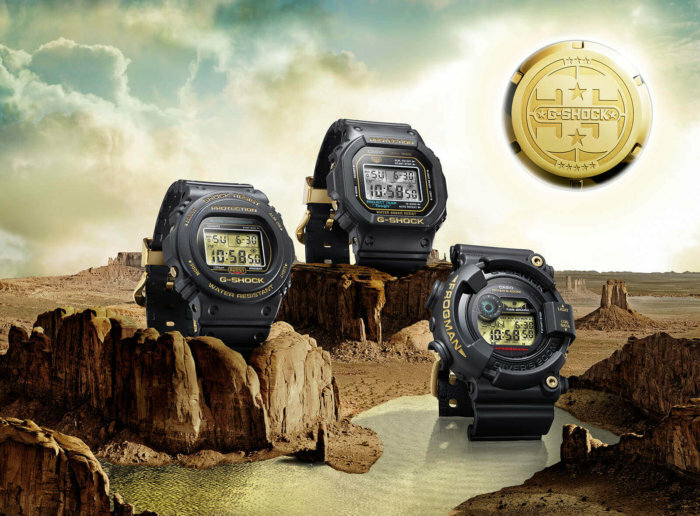 To commemorate the anniversary, Casio has placed special Frogman graphics on many areas of the watch. The MTG-B1000TF-1A has a black IP stainless steel band with a red resin inner layer and is currently the only MTG-B1000 model with a stainless steel band along with the MTG-B1000BD-1A and MTG-B1000D-1A. 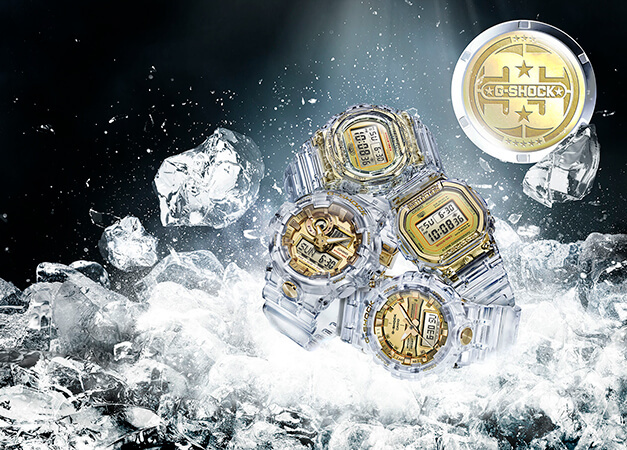 The G-Shock GA-135DD-1A and Baby-G BA-135DD-1A aren’t really full-blown anniversary editions and lack the Eric Haze anniversary logo, but they are unique models featuring natural diamond accents and a special 3-and-5-stars graphic engraved on the gold IP stainless steel case back to signify the anniversary. These models were released in Asia but at least one North American dealer is offering them for sale. They are also available in a special boxed set as the G Presents Lover’s Collection 2018 LOV-18C-1A. The Glacier Gold Collection (or Skeleton Gold in the U.S.) features transparent jelly-style bezels and bands and includes two screw-lock case back models with the DW-5035E-7 and DW-5735E-7. 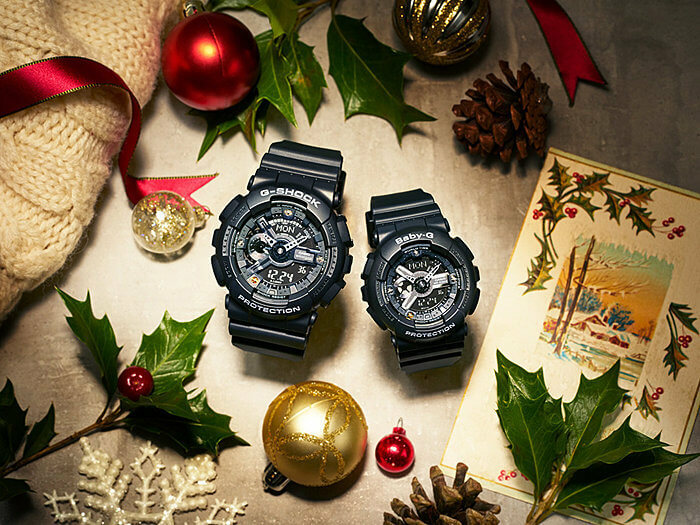 The analog-digital GA-735E-7A and GA-835-7A models round out the collection. These screw-back models are very unique in that the inner stainless steel cases are treated with a gold IP which can be seen through the clear bezel. The analog-digital models have white resin inner cases. The collection is currently available in Japan and coming to the U.S. in October 2018. 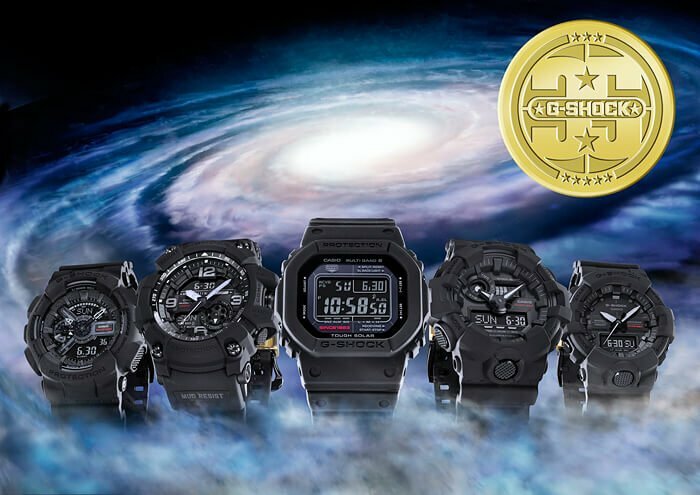 The G-Shock MRG-G2000HA-1A continues Casio’s tradition of announcing its premier limited edition G-Shock model based on the top-of-the-line MR-G at Baselworld and then releasing it later in the year. The MRG-G2000HA-1A is limited to 350 units worldwide and has a list price of $7,400 USD. Like other recent limited edition MR-G models, the titanium MRG-G2000HA-1A is made with the assistance of master craftsman Biho Asano who individually hammered each bezel to resemble the hilt guard or “Tetsu-Tsuba” of traditional Japanese swords. We’re not sure if this model has a 35th Anniversary case back but it does have anniversary labeling on the box and case. The MRG-G2000HA-1A is a June 2018 release in Asia and a July 2018 release in North America. 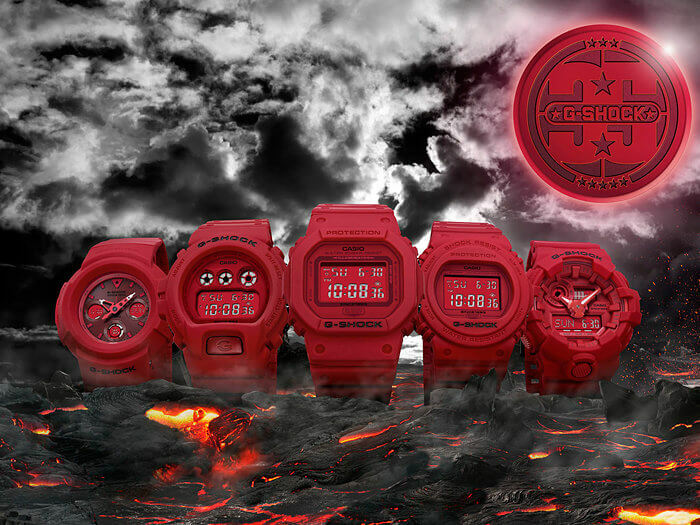 Here is G-Shock giving the old-school fans and collectors what they want. The Origin Gold Collection includes three models with screw-lock cases, the DW-5035D-1B, DW-5735D-1B, and GF-8235D-1B Frogman. DW-5000 tribute models have come to be expected during an anniversary year and it’s nice to see one based on the DW-5000C-1B (which while not as recognized as the DW-5000C-1A, was also one of the original models). The DW-5735D-1B is the first screw-back DW-5700 model we’ve seen since the 25th Anniversary. The GF-8235D-1B is a great option for a more affordable limited edition Frogman. So why are screw-back models such a big deal to G-Shock fans? Well the very first G-Shock watches used a screw-back structure, and in order to be a screw-back the entire inner case needs to be made of stainless steel and not resin. Screw-back models are generally thought of as tougher and of a higher build quality than their counterparts. While the previous anniversary collections were great, they were mostly expected, and now it starts to get really interesting with the GMW-B5000TFG-9 which is an April 2018 release in Japan and Asia. This is a fully stainless steel, gold ion plated version of the origin model with a screw-back case along with Tough Solar, Multi-Band 6, and a Bluetooth smartphone link. While it’s not a true smartwatch, it does have many more features than most 5000-series watches, and the fact that this even exists is a testament to the power of G-Shock. Of course it is fully shock-resistant and water-resistant to 200 meters. This limited edition model is being released alongside the silver GMW-B5000D-1 which is a regular release. Releases like this reaffirm why we love Casio, a company that gives equal commitment to honoring the past and progressing creatively and technologically. The NIGO x K.IBE G-Shock series likely drove a few obsessive collectors mad, as only 35 units of each model were released to the public through an online lottery. 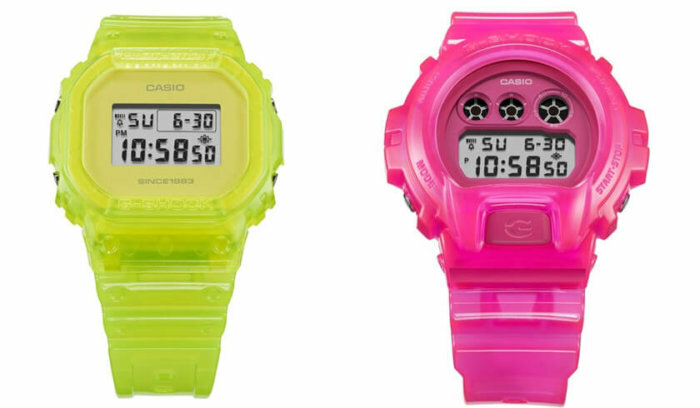 A collaboration between fashion designer Nigo (founder of A Bathing Ape) and the father of G-Shock himself, Kikuo Ibe, these “jelly” models feature a new translucent coloring process that claims to prevent discoloration over time. Well, if basically nobody can buy these watches then hopefully we’ll at least see the new coloring tech used in future models. Like the Big Bang Black Collection, the Red Out Collection uses the new ultra-matte surface tech, only this time in red. This affordable series includes classic mid-size models like the DW-5635C-4 and DW-6935C-4 along with the extra-large, analog-digital GA-735C-4A. The most surprising model was the DW-5735C-4 based on the first round-face G-Shock watch from the 1980s, as it had been a decade since we last saw a DW-5700-series watch. 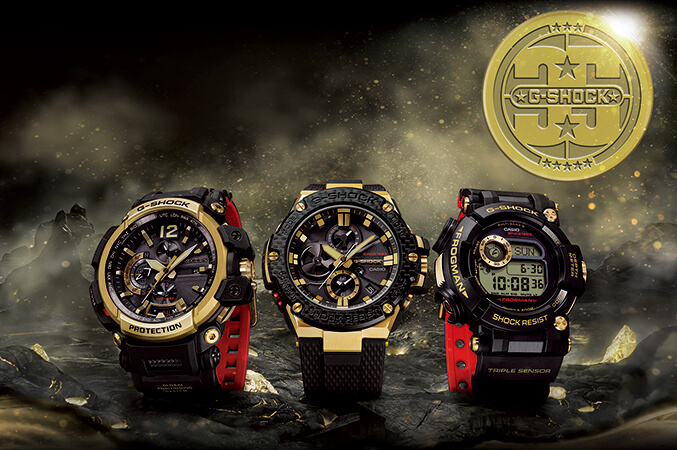 The Gold Tornado Collection includes the G-STEEL GST-B100TFB-1A, Gravitymaster GPW-2000TFB-1A, and Frogman GWF-D1035B-1. These three solar-powered models are the top of their lines and feature advanced technology like Bluetooth connectivity (GST-B100TFB-1A), GPS timekeeping and position tracking (GPW-2000TFB-1A), and a water depth sensor and compass (GWF-D1035B-1). 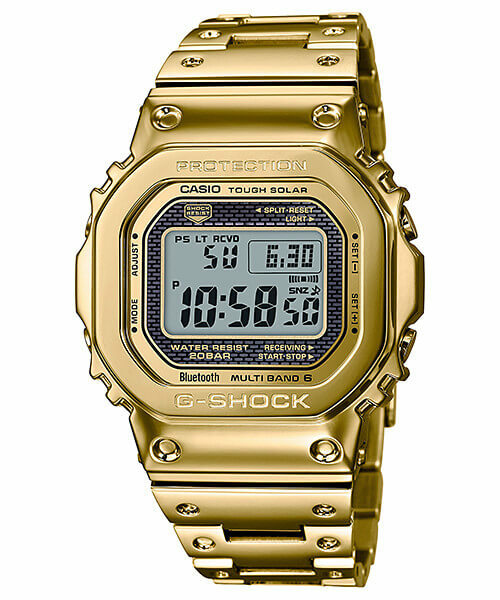 In keeping with the high-end theme, Casio opted to go with celebratory gold accents along with the traditional G-Shock colors of black and red for the dual-layer bands. Artist and designer Eric Haze has been working with Casio since the G-Shock 25th Anniversary and is responsible for the iconic logos that adorn the case back and packaging of limited edition anniversary models. Though the GA-700EH-1A collaboration watch is a 2017 model, it is billed as a 35th Anniversary edition and comes in 35th Anniversary packaging (but the case back features an Eric Haze logo rather than the anniversary logo). The bands have a paint-dripping motif that pays tribute to Haze’s roots as a graffiti artist. 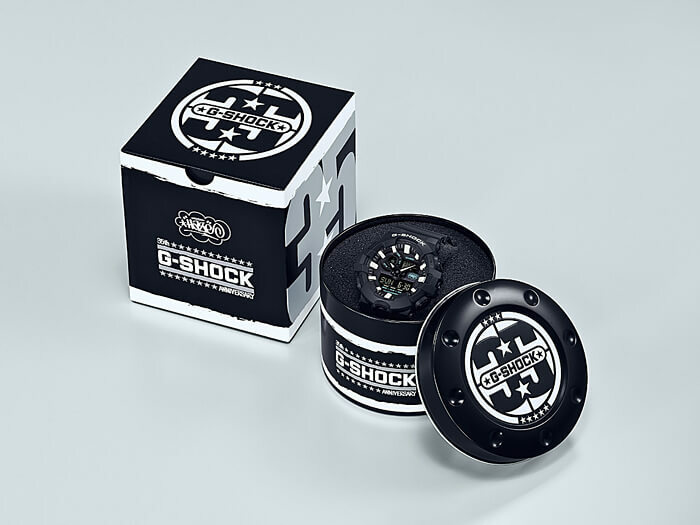 The Big Bang Black Collection (also known as the Neo Matte Black collection in the USA) was the first G-Shock 35th Anniversary series. It made its debut in the fall of 2017 and included the GA-135A-1A, GA-735A-1A, GA-835A-1A, GG-1035A-1A Mudmaster, and GW-5035A-1. These models have a new type of exterior surface created using extra particles in the resin mix to absorb light and provide a more textured look. The result is an extremely matte finish that has a uniquely high-quality look. Of the five models the GW-5035A-1, which is a Tough Solar/Multi-Band 6 model with a stainless steel screw-back case, is the most sought after by collectors and fans.